Roasted Vegetable Salad with “Manouri”* cheese and balsamic sauce. Wash, dry and cut the vegetables into thick slices. Baste the vegetables with olive oil, place them on a grill pan and cook them, turning them occasionally until cooked (you can tell by the change in colour). 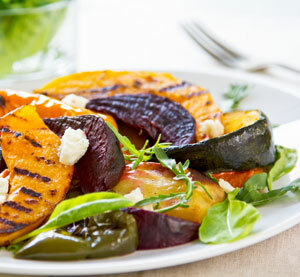 Place the rocket and spinach leaves on a platter; add the grilled vegetables on top. Add the manouri cheese on the grill pan, and then crumble it over the vegetables. In a bowl, whisk together the olive oil, balsamic cream with stevia* and the mustard. Season with salt and pepper. Pour the balsamic cream sauce over the grilled vegetables and serve.